School Library Learning 2.0: #23 (WEEK 9) Copyright, Creative Commons, and Congratulations! #23 (WEEK 9) Copyright, Creative Commons, and Congratulations! In the school library and classroom, we are often faced with copyright challenges of when it is acceptable to copy something and how much of an item [book, website, music, video, etc.] we can copy. Faced with declining budgets and little time, we are tempted to make the copies. But with the advent of file sharing, downloading, and RSS, we must acknowledge and teach the ethics of information gathering and sharing. Creative Commons is a copyright license that allows us to choose to share our intellectual property. This course is designed under a Creative Commons license and is an example of how one can take a piece of information or a product and re-work it to make it fit your needs. By acknowledging the original authors, they have given permission for you to share. One place for good information about what's going on with the Creative Commons is Lawrence Lessig's blog. Better yet, listen to Lawrence Lessig's presentation on "Laws that Choke Creativity." Lessig is one of the Creative Commons developers and a Stanford University professor. Go to the home page (or right sidebar) of this tutorial and find an example or attribution that shows this program has been modified from it's original. Online copyright comic book developed by students at Duke University Law School. “Wanna Work Together?” YouTube video about Creative Commons. California Technology Assistance Project, Region IV cybersafety website. Still good, although CTAP4 has closed down! See Piracy. Congratulations!! You’ve reached the 23rd thing. Give yourself a pat on the back for completing the program. 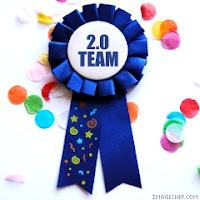 You are now an official member of the large and growing CSLA 2.0 Team. If we offered another discovery program like this in the future, would you choose to participate? In response to earlier requests, we created the shorter but Oh-So-Important tutorial for you on Discovering Assistive Technology. Sign up right away! How would you describe your learning experience in ONE WORD or in ONE SENTENCE, so we could use your words to promote CSLA learning activities? Twitter is an ideal way to send out a 140-character "cheer" or to amplify announcements and direct readers to more detailed information. Sign up and give us your 140-character "tweet"! In fact, send a tweet to @4Libraries to alert us that you've started to sing! maintain your blog as your educational journal on new technology and curriculum connections. start a NEW blog or WIKI -- you are now a pro! Offer Classroom Learning 2.0 to your classroom colleagues -- what a great way to learn and grow and "build community". Another option is to offer students Learning 2.0 for teens.